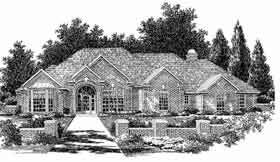 This house plan has a split bedroom plan, which is very popular. An angled counter in the kitchen becomes a terrific serving bar and an eating bar for meals on the run. A large patio extends living space to the outdoors and has access from the master bedroom and the family room. The utility room serves the family efficiently as a mudroom from the garage and as the laundry room. No materials list is available for this plan.